For children, just like cigarettes or mobile phones, clearly impose a negative externality on people who are near them. Anybody who has suffered a 12-hour flight with a bawling baby in the row immediately ahead or a bored youngster viciously kicking their seat from behind, will grasp this as quickly as they would love to grasp the youngster’s neck. The piece later went on, with tongue somewhat in cheek, to propose "child-free zones" in all airplanes, trains, and restaurants, and the introduction of taxes on youngsters. 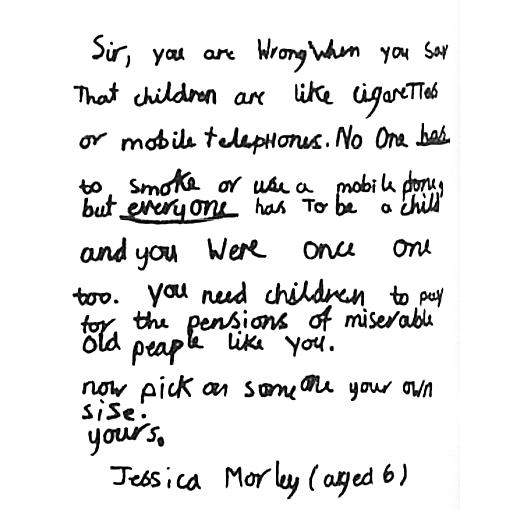 The following letter, from a 6-year-old girl named Jessica Morley, stood out amongst all other responses to the piece, and appeared in The Economist a fortnight later. Transcript follows. Image courtesy of The Economist. Sir, you are wrong when you say that children are like cigarettes or mobile telephones. No one has to smoke or use a mobile phone, but everyone has to be a child and you were once one too. You need children to pay for the pensions of miserable old people like you. Now pick on someone your own sise.